I remember when the Mets brought Kenny Singleton up in the early seventies and put him in right field, alongside Tommie Agee and Cleon Jones. At the time, I was convinced these three would form the best outfield in the National League if not all of baseball for the next several seasons. Shows you how smart I was. Singleton played just two seasons at Shea and then was traded to Montreal for Rusty Staub. The middle season of his three years in Montreal was his best as he reached the 20-homer, 100-RBI and .300 batting average milestones all for the first time in his career. After the following season, the Expos made one of the worst trades in the history of their franchise when they sent Singleton and starter Mike Torrez to the Orioles for a washed up Dave McNally and outfielder Rich Coggins. Singleton went on to a great playing career for the O’s, making three All Star teams, appearing in two World Series and finally winning a championship in 1983. I always admired Singleton as a player. He was consistent and very professional on the field and the same can be said for his performance in the Yankee broadcast booth. I enjoy listening to him do color and play-by-play. He was born on June 10, 1947 in the Big Apple. Singleton shares his birthday with this former Yankee receiver and this long-ago Yankee pitcher. Arch McDonald was the original voice of the New York Yankees. The three original New York City MLB franchises were the last three to permit radio broadcasts of their games. They all caved together in 1939. 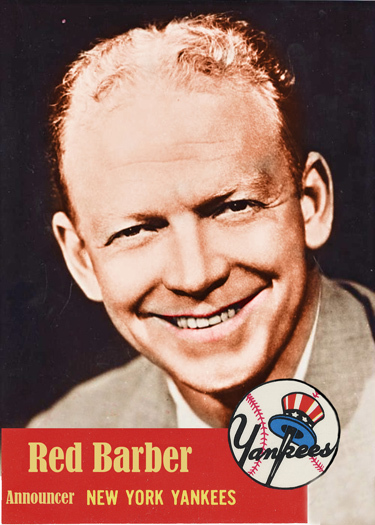 Brooklyn hired Red Barber for their booth and the thrifty Yankees and Giants decided to share an announcer. Since the two teams never had home games scheduled on the same day and had both agreed to blackout broadcasts of road games, it was possible that one person could do play-by-play for both teams. That person turned out to be McDonald. When the Yankees finally went on radio, the sponsor of their broadcasts, Wheaties Cereal lured McDonald to New York with a big salary. The first ever radio broadcast of a Yankee game took place on April 17, 1939, with McDonald doing the play-by-play. During that first season, a young CBS announcer by the name of Mel Allen was also hired as McDonald’s assistant. In addition to being the first radio voice of the franchise, McDonalds’ next most significant contribution to Yankee history was coming up with the nickname of “Yankee Clipper” for slugger, Joe DiMaggio. It would end up being Barber and Allen who did the best job at capturing and keeping the attention of Big Apple baseball fans.Those two injected their calls with a lot more enthusiasm and a lot more words than McDonald, who preferred to describe a play and then stop talking until there was another play to describe. 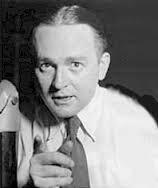 The silence in between proved deafening for radio listeners and McDonald was let go after just one season in New York, leaving Allen to take over the Yankee booth as number one announcer. McDonald ended up going back to Washington, where he became a sports broadcasting institution, doing both Senator and Redskins games. In 1946, President Harry Truman, a regular listener, convinced the announcer to run for congress. He ended up losing the election. He kept doing both Senator and Redskin games right up until he died in 1960, of a heart attack, during a train ride back to D.C. after a Giants Redskins football game. He was 59 years-old. May 23rd is also the birthday of this one-time back up catcher, this former Yankee Manager and this other former Yankee manager. It is still hard to believe Bobby is gone. He became my favorite Yankee when he was brought up in 1969 to replace my previous favorite Yankee, the great Mickey Mantle. Even though he developed into a very good big league player, he was no Mantle. He was instead, the very best player on a very bad string of Yankee teams and I loved the guy. I remember being very upset when Bobby was traded to the Giants for Bobby Bonds right after the 1974 season. I remember being overjoyed when the Yankees put him back in pinstripes during the 1979 season. I hated to see him retire during the 1983 season but I enjoyed listening to him and learning more about him during his many years in the Yankees’ broadcast booth. When he died from a brain tumor in July of 2008, Yankee fans around the world mourned him. Had he lived he would have turned 68 years-old today. In April of 2014, the Yankees announced that they would be placing plaques in Yankee Stadium’s Monument Park to honor Paul O’Neill and Tino Martinez, two great Yankees who certainly deserve the recognition. But what about Bobby Murcer? 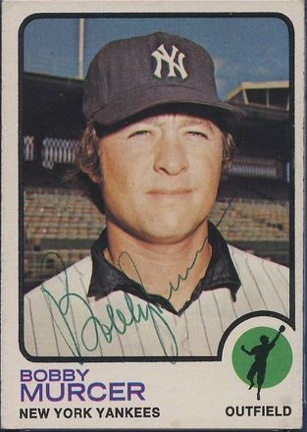 Bobby shares his birthday with the first closer in Yankee history, this one-time Yankee pitcher and this one too. I never heard Walter “Red” Barber announce a Dodger game. I was born in 1954, the same year Barber left the Brooklyn booth to join Mell Allen in the Bronx. By the time I was old enough to remember him announcing Yankee games, his voice and style really didn’t make much of an impression on me. Allen was my guy and I can still remember details about the way he called games and talked about different Yankee players. Then I read Roger Kahn’s classic Boys of Summer and fell in love with the old Brooklyn Dodgers, so in love that I continue to strive to improve my knowledge of D’em Bums still today. In doing so, I’ve had the opportunity to listen to tapes and watch old television broadcasts featuring Barber during his days describing the action at Ebbetts Field. This younger Barber was much better than the older Yankee version I remember listening to on my big brother’s GE transistor radio as a boy. He did those Dodger games with more emotion and made much more liberal and entertaining use of the glorious homespun lexicon of his native Mississippi. From “can of corn” to “walkin in the tall cotton,” the Ol’ Redhead invented a whole new way of describing the action taking place on a Major League baseball field that endeared him to hundreds of thousands of Dodger fans and got him into the Hall of Fame. Barber’s most famous moment in the Yankee booth took place sadly the day that cost him his job. On September 22, 1966, the Yankees were ending a season that would see them finish in last place and playing in front of a paid home crowd of just 413 people. Barber rightly attempted to focus his television audience’s attention on the fact that the once mighty Bronx Bombers had fallen on such hard times that nobody was willing to pay to see them play. He instructed his cameramen to focus on the thousands upon thousands of empty seats that existed in the House that Ruth Built that afternoon but was overruled by one of the Yankee suits upstairs. He was fired by new club president Mike Burke just a week later. Barber died in 1992 at the age of 84. This former Yankee reliever , this one-time replacement for A-Rod as Yankee third baseman and this great former Yankee first baseman were each also born on February 17th. I’ve listened to a lot of play-by-play announcers do baseball games, especially Yankee baseball games and I have to admit that none of them have done it better than Michael Kay is doing it right now. He’s knowledgeable, always well prepared, he’s got a sharp sense of humor and he’s got a great broadcasting voice to boot. I thought Kay’s call of Derek Jeter’s 3,000th hit was one of the best ever made. His ability to adjust to whoever YES throws in the booth with him is very impressive. Doesn’t matter if Paul O’Neill is insulting him, or David Cone is droning on and on about some pitcher’s delivery, Kay not only complements his partners in the booth, his ability to ask them extremely pertinent questions that draw on their own expertise and experience is a real plus for fans watching the game. 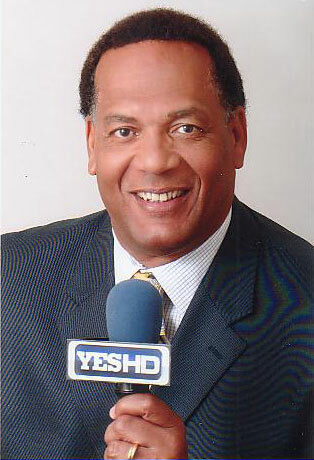 A native of the Bronx, Kay was a sports reporter for both the New York Post and Daily News before he began doing Yankee games on the radio for WABC in 1992. A gifted interviewer, if you haven’t seen his Center Stage interview program on the YES network make sure you check it out. He’s already won numerous Emmys for his television work and his daily ESPN Radio show is also very popular. 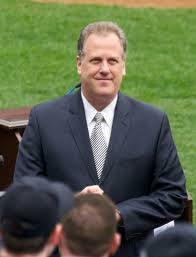 Like most Yankee fans, I sometimes get irked by some of the things Mr Kay has said into a microphone. I thought the biggest goof of his career was predicting the Texas Rangers were toast after the Yankees came back from a five run deficit to beat them in Game 1 of the 2010 ALCS. Despite these occasional misspeak’s, Kay has been an outstanding asset to Yankee broadcasting and I predict that some day he will end up in the broadcaster’s wing of Cooperstown. Kay was born on this date in 1961. He shares a birthday with this one-time Yankee utility outfielder, this former Yankee war-time catcher and this member of the Football Hall of Fame. Originally the very first genuine “Amazin” Met, today’s Pinstripe Birthday Celebrant almost single-handedly turned Shea Stadium’s tenants from a running joke into a bonafide professional baseball team. Then, beginning in 1975, Met President M. Donald Grant committed three of the dumbest mistakes in Major League front office history. First he enraged Tom Seaver by penny pinching him during the Mets last pre-free-agent era negotiation with their Ace in 1975. Then when baseball’s age of free agency began the following year, Grant refused to go after any of the newly available superstars who could have rejuvenated a Mets’ roster that had grown very mediocre. Grants final error, the biggest of them all, was trading Seaver to the Reds in the first half of the 1977 regular season for four pretty ordinary big league players. 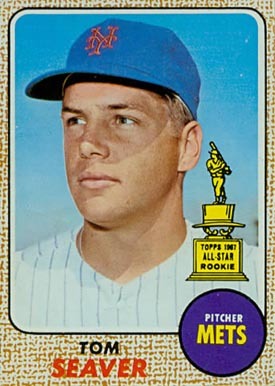 Seaver would go on to win 20 games that year and the NL Cy Young Award. He would continue to pitch for another decade and on August 4, 1985, while pitching for the White Sox against the Yankees on Phil Rizzuto Day at Yankee Stadium, Tom Terrific won his 300th big league game. The Yankee crowd that day adored Seaver and Yankee boss George Steinbrenner noticed. He would spend the next year trying to put the future Hall of Famer in pinstripes but could never quite reach an agreement with Chicago. At first, the Boss refused to give up any of his young stud pitchers for the aging right-hander and then it was Chicago GM Ken Harrelson’s turn to balk when Steinbrenner offered him disgruntled Yankee DH Don Baylor for Seaver. So Seaver went to the Red Sox instead and finished his playing career in Beantown with a 5-7 record during the 1986 season. Two years later, Steinbrenner finally brought the Fresno, California native to Yankee Stadium as Phil Rizzuto’s broadcasting partner. He and the former Yankee shortstop remained a pair for the next five seasons and Yankee fans who were around to witness how extremely well these two Big Apple baseball legends got along in the booth, loved them. In 1990, just as Steinbrenner was about to begin serving his “Howie Spira induced” lifetime ban from the game, the Boss was considering removing Seaver from the booth and making him the Yankees’ GM. That never happened. Seaver now spends his days overseeing his California vineyards. 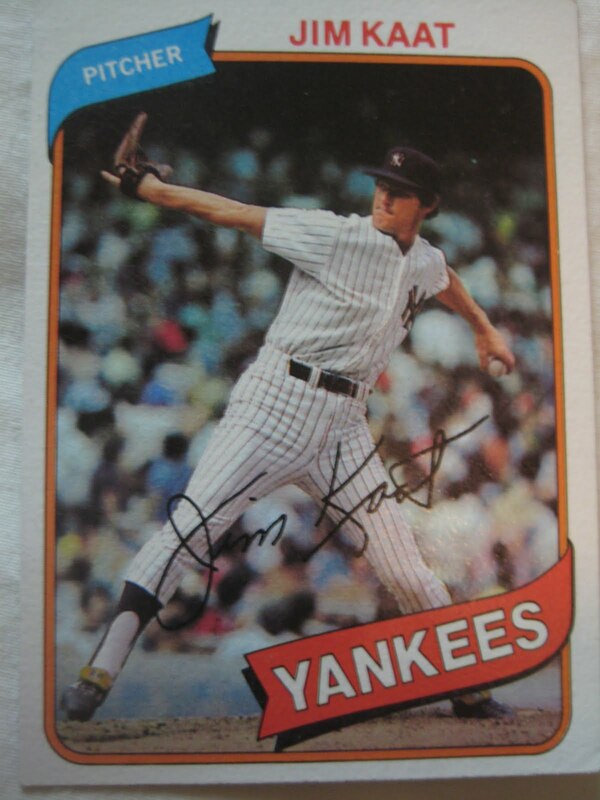 He turns 69 years old today and shares a birthday with this former Yankee reliever and this long-ago Yankee skipper. The “Scooter” will always be my all-time favorite Yankee announcer but not because he was a particularly good analyst or play-by-play guy. Quite the opposite, he was petty bad at both. But Rizzuto helped me enjoy Yankee broadcasts regardless if the team won or lost and he wore and flashed his unabashed lack of objectivity on behalf of the Bronx Bombers like a badge of honor. As much as I enjoyed Rizzuto, I appreciated Jim Kaat. His award-winning commentary taught me things I didn’t know about the game of baseball and how it is played at the highest of levels. He did a great job of explaining technical things to his non-technical audience, like why a curve ball curves, what pitchers have to be prepared for in a suicide squeeze situation, and how the best fielding catchers play the spin of the ball on foul pops. Unlike Rizzuto, who played his ball before my time during the forties and early fifties, “Kitty” played his rookie season just one year before I became an avid fan of Major League baseball. I loved to listen to him talk about his personal experiences with ballplayers he played with and against, especially during the sixties. Back before you could watch every Yankee game on TV or bring up Major League Baseball’s Web site on the Internet, the only things I knew about players like Bob Allison, Zoilio Versailles, Don Mossi, or Leon Wagner were printed on the backs of the baseball cards that I collected as a kid. Kaat’s vivid memories of the players I grew up watching gave life to the faces on those cards for me. In addition to announcing for the Yankees for a dozen seasons, Kaat pitched in Pinstripes for parts of both the 1979 and 1980 seasons. He ended his 25-year playing career three seasons later, with 283 career victories. Jim Kaat belongs in the Hall-of-Fame. Also celebrating a birthday today is this former Ole Miss quarterback and this one-time knuckle-balling starting pitcher.